Find out about examinations, treatments and tests to stay healthy. 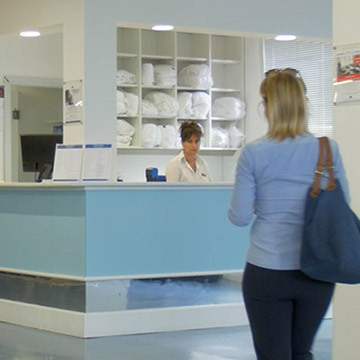 Terme di Sirmione’s Osteopathic Physiotherapists mainly treat musculoskeletal-type structural and mechanical problems, to which functional alterations of the organs and intestines and the craniosacral system can be added. Osteopathy aims to correct the imbalance created following painful symptoms to re-establish the harmony and rebalancing tension. It acts for therapeutic but also preventive purposes and can be supplemented with other medical disciplines, such as, for example, physiotherapy and odontology. It is used in disorders of: musculoskeletal system (cervical, dorsal and lumbar pain; vertebral, joint, costal, intercostal pains; pain from sports injuries, pain from disk hernia, coccigodynia, tendonitis, osteoarthritis etc.). It is also concerned with disorders of the digestive system (hiatal hernia, colitis, constipation) of the genito-urinary (amenorrhea, post-partum syndrome, menstrual pain), the neurological and neurovegetative system (sleep disorders, neuralgia), the circulatory system (venous or lymphatic congestion) and disorders of the airways (rhinitis, sinusitis, otitis, swallowing problems). Integration with rehabilitation and thermal treatment enables a complete, effective treatment available to the patient. To encourage you to look out for your health all year round, Terme di Sirmione offers special rates. Appointments with specialists (in the same branch of medicine) within 365 days of your first check-up are classified as regular check-ups (€65.00). A discount of 15% is applied to appointments with specialists (in different branches of medicine) within 365 days of your first specialist check-up. Discount of 15% on the second cycle, if equal to the first and carried out in the same calendar year. The second cycle is accessed following an admission check-up. 15% discount on the purchase of 2 private programmes not subsidised by the Italian NHS: the 15% discount is applied to the programme that costs less. Osteopathic assessment with first treatmen.